"If Iraq is to teach us anything, it must be that a new idea cannot be beat into a society." Maj. Walt Cooper, Baghdad, 2006 via today's Washington Post. 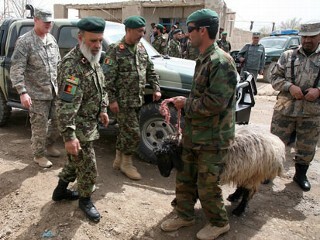 "General Petraeus, winning the hearts and minds of the Afghans is not the job of a soldier. 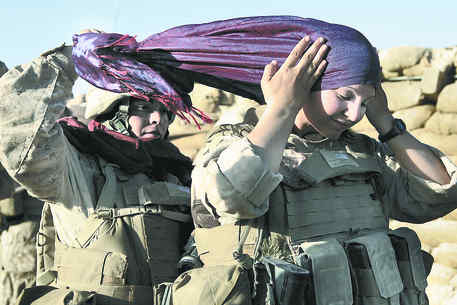 That's the job of an Afghan." Mohammad Umer Daudzai, chief of staff to Afghanistan President Hamid Karzai, recounting a meeting last week with Gen. Petraeus in Sunday's Washington Post. Joel Brinkley: Why Is America Fighting and Dying for Proud Pedophiles? Joel Brinkley, writing in the San Francisco Chronicle, lifts a rock and finds Afghan culture -- predatory and abusive, twisted out of human shape by a fusion of Pashtun and Koranic influences. My platoon was patrolling Dora 12 hours a day, taking turns with another, and we were always tired. I had lost 20 pounds in two months because I usually chose sleeping over eating when we returned to the base. On the roof, the scouts and I were looking at one another with half-closed, bloodshot eyes when the muezzin in the mosque began chanting in Arabic. His voice streamed from the speakers strapped to the top of the minaret and reverberated off the concrete buildings. "We are Americans, each with an equal right to worship and pray where we choose," New York City Mayor Michael Bloomberg said this week. "There is nowhere in the five boroughs of New York City that is off limits to any religion." Our founding documents guarantee that -- and not just in the five boroughs. Florida's District 22 -- Broward and Howard Counties -- is where it's at this election season with the splendid Col. Allen West (USA ret.) handily winning his GOP primary. "This evening, after nearly 2 years of hard work, our campaign to restore honor, integrity and character to Washington reached an important milestone. With a vast majority of the precincts having reported their results, we will have defeated David Brady by a margin of nearly 4 to 1. With GOP turnout significantly higher than democratic turnout throughout District 22, our victory tonight is proof that South Floridians are sick and tired of the status-quo in Washington, and are looking for leaders instead of politicians." More here about the race for the House seat currently -- and temporarily! -- held by Democrat Rep. Ron Klein. And more about Allen West in next week's column. Brand new Yale teacher Stanley McChrystal will be hitting the lecture circuit and bringing in between $30,000 and $60,000 a pop, says CNN, when he isn't lecturing not exactly for free in a seminar called "Leadership," says the YDN blog Cross Campus. The course for 20 mainly grad students "will examine the way modern technologies and media and global politics present new challenges for leaders, with a focus on military leadership from 9/11 to the present day." Does that mean like what happens when a commander talks trash in front of a reporter on one continent and it gets published on another? From left to right: Kingdom Foundation director Muna Abu Sulayman, a happy Harvard official, Talal and wife Ameerah celebrating in 2008 Talal's $20 million purchase of -- I mean, donation to build -- an Islamic studies program at Harvard. The Saudi prince whose post-9/11 relief check was rejected by former New York Mayor Rudy Guiliani has found a more willing recipient in the city for his millions: the head of the Ground Zero mosque project. The same Saudi potentate, Saudi Prince Alwaleed bin Talal, owns the biggest chunk of the parent company of the Fox News Channel outside of the Murdoch family. Winning hearts and minds means losing your own. It involves teaching defenders of the Declaration of Independence, the Constitution and the Bill of Rights to "respect" an Islamic tribal culture (as advocated by Admiral Mullen and other leaders) that subjugates women, girls, boys and non-Muslims (assuming there are any of the last left in the country ), while increasingly assuming its customs -- from troops adopting native dress to a US admiral involving himself in the ritual slaughter of sheep, to redefining our very perceptions of reality. Now, it's part of basic training. The title of the excerped AP report below is "War doesn't rest for Islam holy month." But maybe the title should have been "Islam doesn't rest for war" -- as in doesn't let the war stop its dawa (proselytizing), only now that proselytizing is starting to a bit like Dawa, Uncle Sam-Style. That would be a Happy Ramadan poster on a US base mess hall tent. Just curious: Does the military post Happy Hannukah, Merry X-mas and Yay Diwali (Hindu holiday) posters on mess hall tents as well? Tariq Ramadan holds an MA in Philosophy and French literature and PhD in Arabic and Islamic Studies from the University of Geneva. In Cairo, Egypt he received one-on-one intensive training in classic Islamic scholarship from Al-Azhar University scholars. He is currently Professor of Islamic Studies at Oxford University while also teaching at the Faculty of Theology at Oxford. He is at the same time Senior Research Fellow at Doshisha Universoty in Japan and president of the European think tank European Muslim Network. He has called for a moratorium on the shariah-sanctioned practice of stoning. Stonings at Ground Zero -- that'll be the day, right? The concept has no manifestation beyond the cold sweat of a dark-hours nightmare. Still, there's something worth gleaning from the not-so-free association process that inspired it. Morocco's Hassan II: "Shariah Is Written in Our Hearts Whether One Wants It or Not"
From the late king's mouth via Gates of Vienna (subtitles by Vlad Tepes). We've been hearing more talk, buzz and chatter about Shariah lately than I imagined was possible. Unfortunately, much of it is still uninformed and reliant only on the emotional bouyance of 9/11, as though the battleground of Lower Manhattan is the only place a Shariah-advancing imam should be barred from building an anti-Constitutional outpost of Islam. Defenders of the mosque project, meanwhile, exhale testaments to religious freedom and tolerance that crest and crash over the apparently unimagined, unknown, ungrasped perils to liberty, equality and freedom of conscience that are actually advertised in Islam's mainstream tenets. We must support this mosque, we are told, lest we become, as MSNBC's Norah O'Donnell actually said on the air (without blushing, fainting or otherwise convulsing), like the 9/11 jihadists. But this is a kind of tolerance without limits. Here's something bouncing around the Internet that just might explain that special gleam in Mayor Bloomberg's eye when he $aid, in the name of tolerance (sniff), that the Ground Zero Mosque was welcome in NYC. "Bloomberg Set for Dubai Hub Expansion in Bid to Double Revenues by 2014"
It's never been clear what really happened on that foggy morning of April 10 when a Polish airplane crashed on a Russian runway, killing all 96 people aboard including Polish President Lech Kaczynski, cabinet ministers, military service chiefs, intelligence officials, the central bank president, parliamentarians, historians, decapitating the conservative government and gutting the country's elite. As the last U.S. combat troops prepare to leave Iraq this month, the State Department is struggling to implement an expanded mission that it has belatedly realized it might not be able to afford. Money isn't the only problem. The "expanded mission" comes down to the surreal exercise of (still) training (demonstrably untrainable) Iraqi police. Beginning in September, the State Department will take over all police training in Iraq from coalition military forces, and it has proposed replacing its current 16 provincial reconstruction teams spread across the country with five consular offices outside Baghdad. But since planning for the transition began more than two years ago, costs have skyrocketed and the money to pay for them has become increasingly tight. Congress cut the State Department's Iraq request in the 2010 supplemental appropriation that President Obama signed late last month; the Senate Appropriations Committee and a House subcommittee have already slashed the administration's $1.8 billion request for fiscal 2011 operations in Iraq. "Live our values," Gen. David Petraeus wrote recently to troops in Afghanistan. "This is what distinguishes us from our enemies." Unfortunately, this is also what distinguishes us from many of our "friends." This culture-chasm is what makes the infidel struggle for hearts and minds across Islamic lands so recklessly, wastefully futile, something I was once again reminded of on reading Time magazine's cover story featuring 18-year-old Aisha. Aisha is a lovely Afghan girl whose husband and brother-in-law, on instructions from a local judge and Taliban commander, sliced off her ears and nose and left her dying to set an example for other wives thinking of running away from abusive in-laws. Only her discovery by U.S. troops saved Aisha's life. Michelle Obama and I are both on vacation this week -- just not together. She, along with 40 of her "closest friends" (and 70 Secret Service agents), is celebrifying it up on Spain's Costa del Sol; I'm freeloading at my mom's in New England (with the family dogs). Of course, what American could afford more after paying for Michelle's $2,500 a night hotel room -- or at least whatever the 70 Secret Service agents' room-and-board cost?